I have a love-hate relationship with loops in letters. 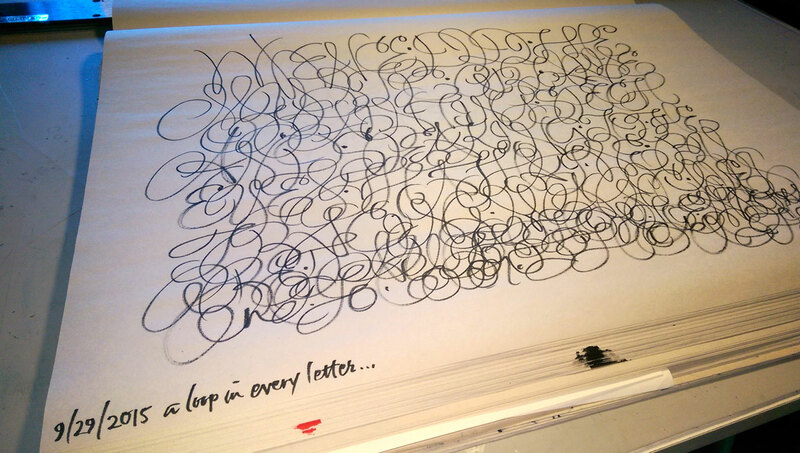 I generally hate mine, I often hate loops made by other people, but I love loops made by a few wonderful calligraphers who really know how to swing it. 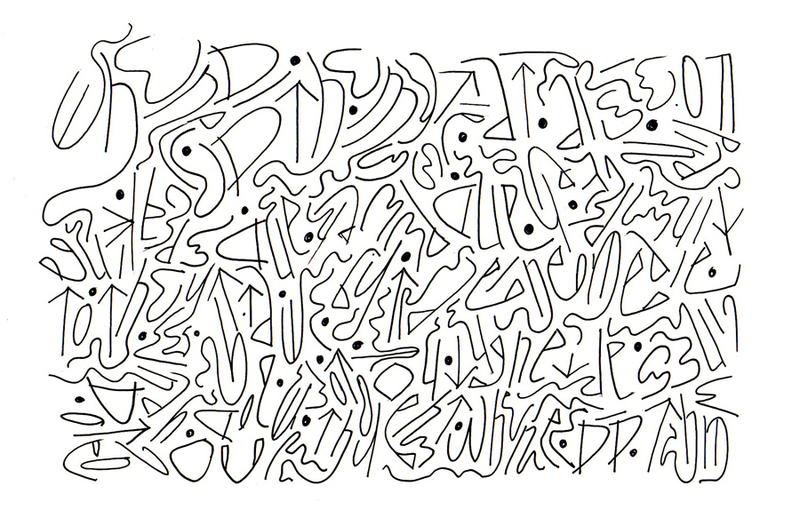 I though that I might use loops to generate a certain texture — I’m back to reading Burgert’s Calligraphic Line again. As usual, click on the image for a closer look. I did this a few days ago, lost it, and just found it again today. 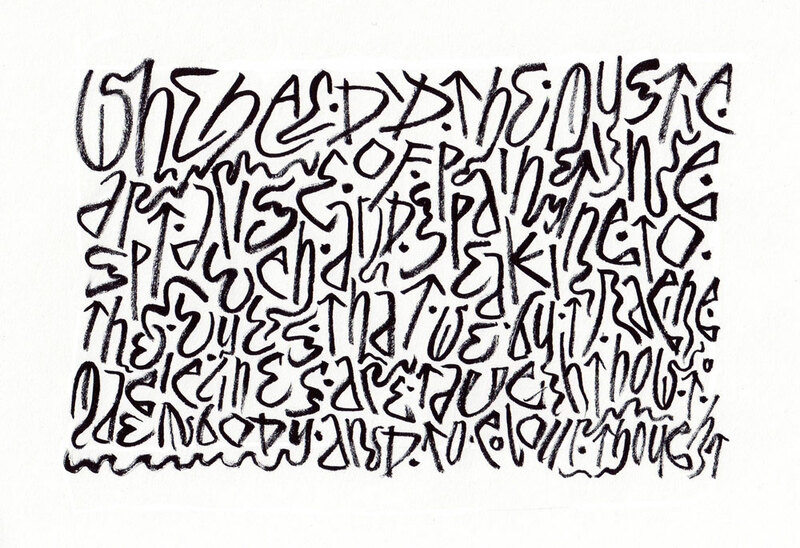 More abstraction of the letter forms I’ve been using from Hans-Joachim Burgert’s book. This is fairly small, a sheet torn from a 6″ x 8.5″ book of Canson Mi-Tientes paper, done with Luna metallic watercolors and a #6 Mitchell nib, I think. 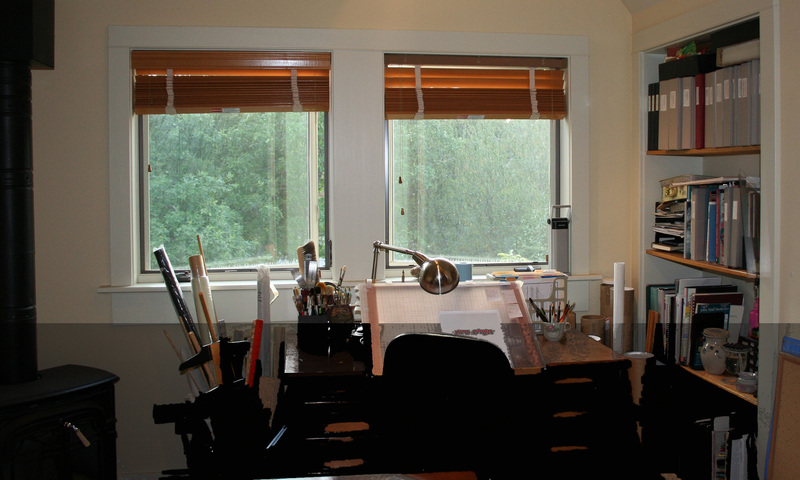 Moving towards a two-dimensional , flat all-over pattern. I tried to keep the pen-angle, pen-width size, letter order and shape intact, abandoning word spacing and changing only the direction. Sometimes I broke the rules to preserve the texture, but sometimes the broken rules were inadvertent. Continuing the abstraction, but changing the line by using a new tool: a brush. Looking at this again, I see that abstraction doesn’t want to stay. 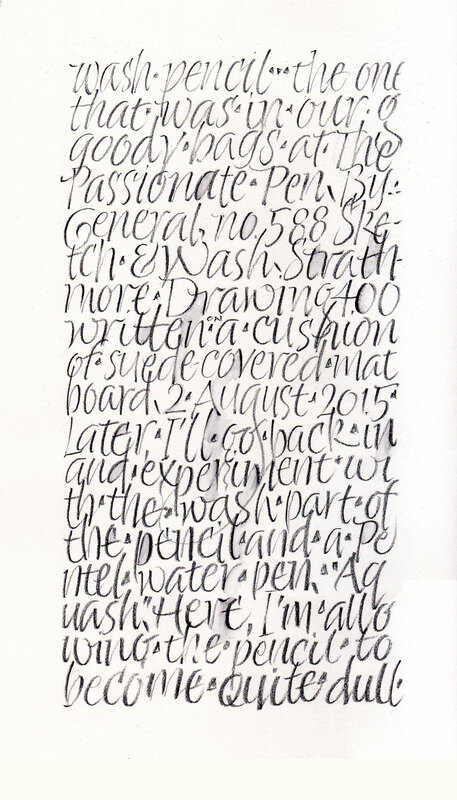 I seem to have drifted back towards legibility a little. Now’s it more work — not work, but play, difficult play. 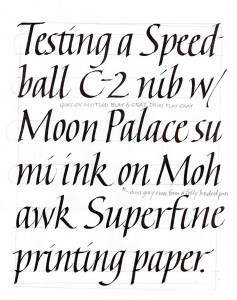 And a nice change from the italic exemplar over which I slaved most of today. There is nothing like making an exemplar to point up all the ways my lettering falls short! 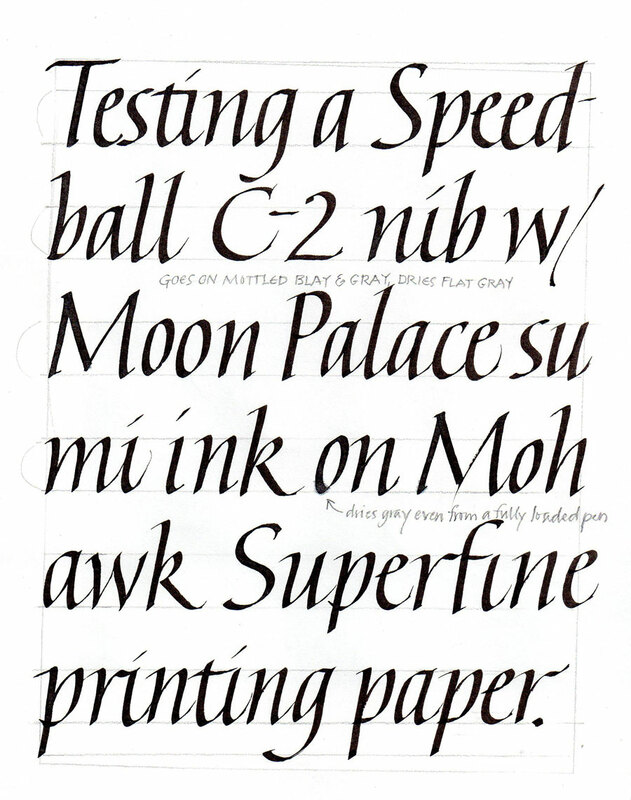 I’m tempted to start again with another set of formal letters, but I may move on. Using this alphabet, I wrote out a quotation following standard rules of typography, writing left to right in horizontal lines, paying attention to kerning, and so on. , but was surprised at how little I had moved along the typography/abstraction spectrum between lettering 2 and lettering 3. So far, it’s fairly easy, so I probably haven’t gone far enough yet. 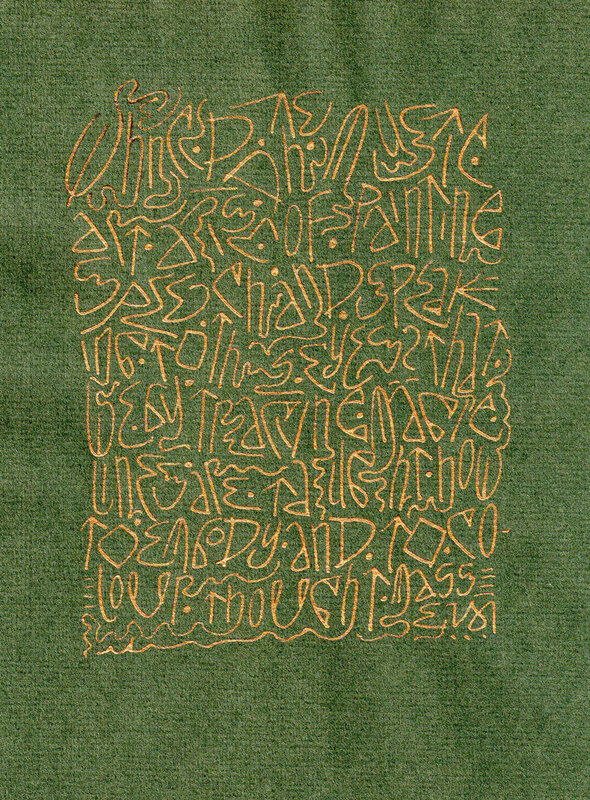 I had planned to write about Irene Wellington today, but I’m still back at that page of even texture that Hans-Joachim Burgert discusses in The Calligraphic Line. I tried it again today. I have things to say about it, but most of it is on the page itself, so why repeat myself? 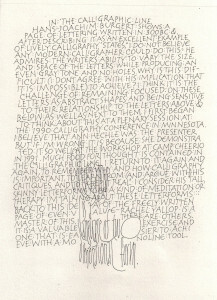 If you want to read it, click on the image to get a larger image. I did try to have a more open texture than yesterday, but as I progressed down the page I reverted to my “default” density, I guess. Something to work on. There’s always something to work on. There are always multiple things to work on. 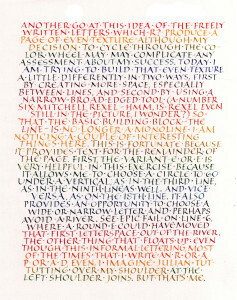 I was particularly aware of the left shoulders of letters like R, P, and D.
This 9″ x 12″ page (IRL the margins are somewhat larger) was BK Rives Heavyweight, which is rather grainy, especially at an x-height of something less than 1/4 inch. H is for Hans-Joachim Burgert. 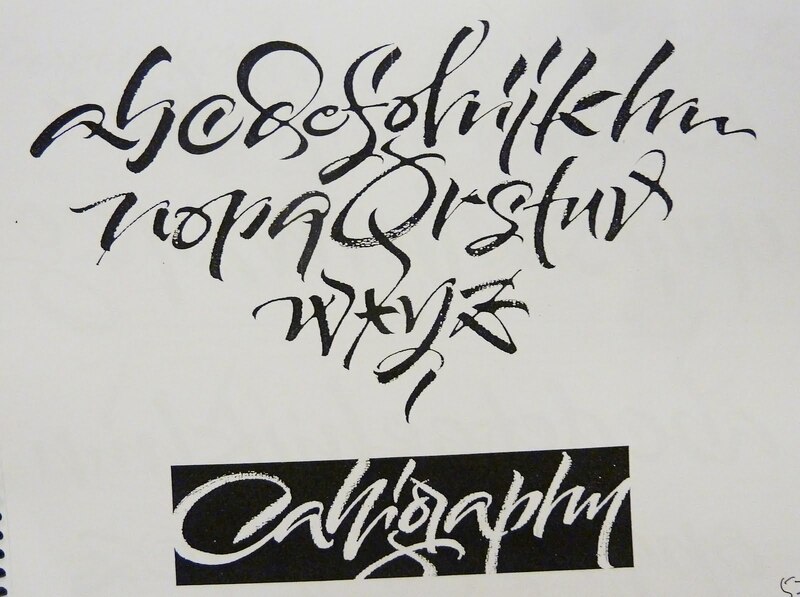 Thanks to Brody Neuenschwander’s translation, we English-speaking calligraphers have access to Burgert’s book The Calligraphic Line. This book looks at calligraphy from the perspective of two-dimensional design, and primarily a line in two-dimensional design. But that description is limited; the book is much more. 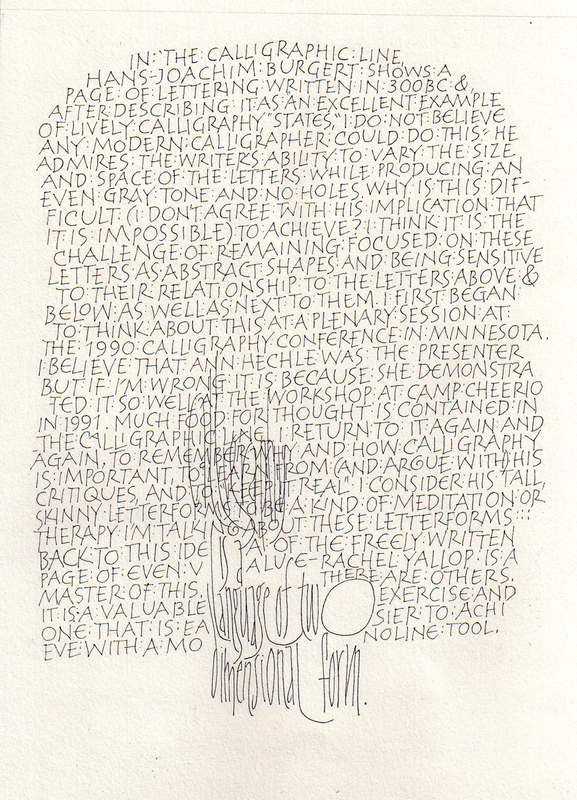 Burgert struggles with definitions of calligraphy. 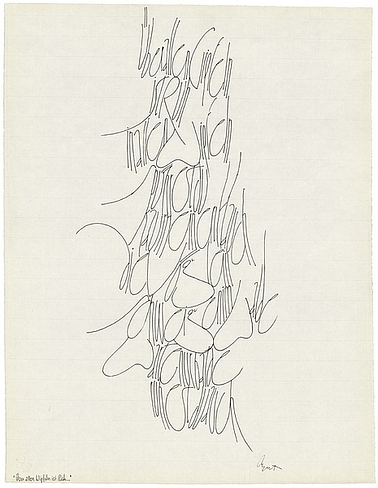 He applies formal critique to calligraphy, setting it firmly in the modern art world. There is no similar book to be found, and I consider it to be part of the central canon of calligraphy literature. As I wrote in today’s daily lettering, this book is one that I return to again and again, to learn from (and argue with) his critiques, and to re-ground my thinking about calligraphy. 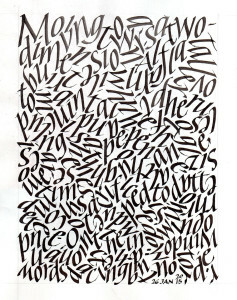 Over the years, I have studied the lettering in several of his pieces. This is the lettering I associate with him (found in this collection but not easily pointed to in situ). 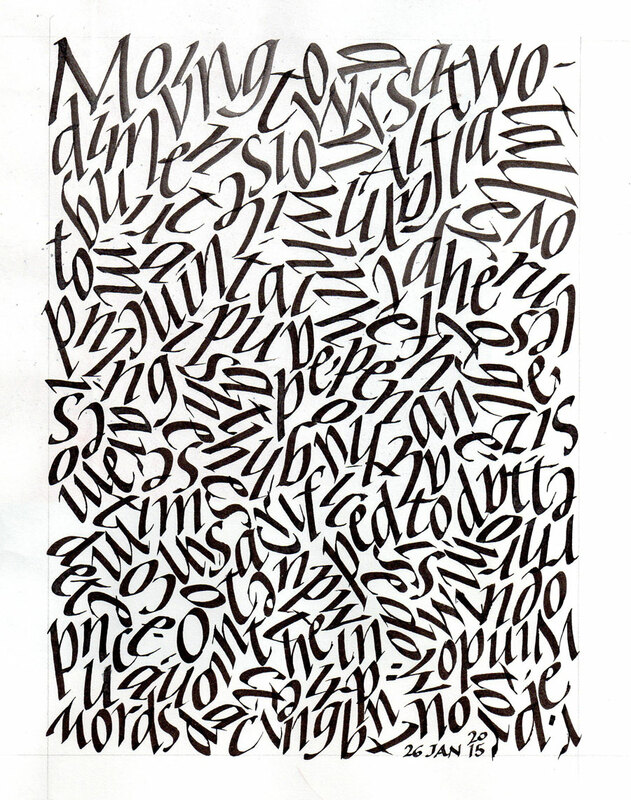 Today’s lettering is mostly freely made capitals written with a size 005 Zig Millennium marker on a 9″ x 12″ page. It is a response to a statement (or challenge) he makes about a piece of calligraphy written circa 300 BC. 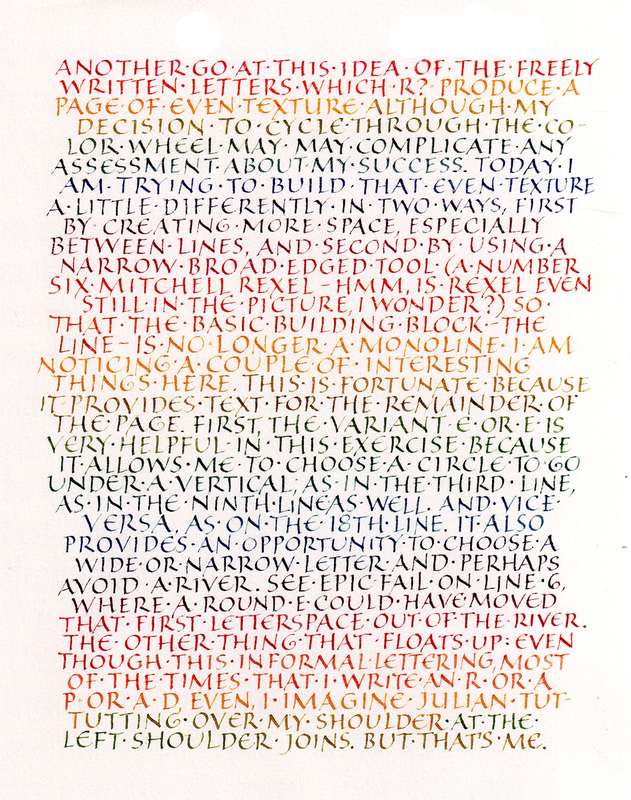 He admires the writer’s ability to write so freely and yet maintain an even texture and color, and he states,”I do not believe that any modern calligrapher could do this.” I tried it. 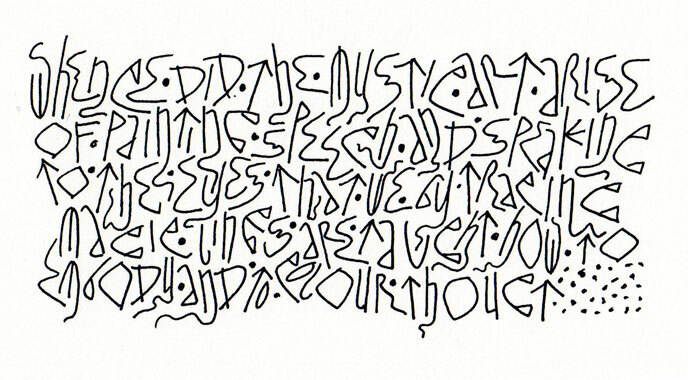 Towards the bottom I quoted him one of his lettering styles which I’ve studied in the past. Click on the thumbnail for a larger view.